Due to the complexity of the language and the presence of some low-level language features, "Clean C++" seems to be an oxymoron for many developers. Especially in enterprise land, C++ applications tend to have large code bases grown over several years. Those legacy code bases tend to suffer from underdeveloped or missing unit and integration tests. Development teams maintaining such code bases resign over time and adopt "don't touch it, you'll break it" policies. Nevertheless, it is possible to write clean C++, to at refactor even large C++ code bases as needed and cover critical parts with automated tests. The key elements to successfully regain control over code quality are a dedicated team and a set of properly sized and prioritized steps towards that goal. C++ is a complex language and with the introduction of move semantics, noexcept and constexpr in C++11 and later, defining or declaring the right combination of magic keywords in the right place is daunting for the uninitiated. In spite of more than 40 years of programming practice, we still make even the most basic errors of API design and coding: integer overflow, error prone floating point arithmetic, unconstrained / flawed templated interfaces. C++ is notorious for things such as performance, expressiveness, the lack of a standard build system and package management, complexity and long compile times. Designing and building the runtime reflection system from tomorrow, today! With the introduction of libraries like LLVM and libclang, building custom tools for C++ is more approachable than it has ever been before. With Clang we have a fantastic tool to analyze and augment the C++ AST without writing our own compiler or parser. In this talk we'll go over the design and implementation of a runtime reflection system, demonstrating the use of Clang and the LLVM framework to craft custom C++ tools for your own needs. We'll be able to query the members of a class, inspect their types and size, as well as qualifiers and user-definable flags. To show-case a real-world usage of the solution, we'll add a way to easily serialize any class to or from a byte stream, by making use of the reflection information. The implementation is available under a permissive open-source license on Github (https://github.com/leandros/metareflect). C++ was lacking the reflections feature for a long time. But a new metaprogramming trick was discovered recently: we can get some information about structure by probing it's braced initializes. Combining that trick with variadic templates, constexpr functions, implicit conversion operators, SFINAE, C++ core issues, decltype and integral constants we can count structure's fields and even deduce type of each field. With the standardisation of C++11, C++ got a multithreading library and a memory model. The library has the basic building blocks such as atomics, threads, tasks, locks, and condition variables. The memory model provides guarantees for the thread-safe usage of this basic building blocks. As a developer of a static analyzer, I have to review lots of defects in C++ code. Many of them could have been avoided by using modern C++ techniques and additional code quality tools. unit testing, guidelines, modern C++ standard, code review, static analysis, dynamic analysis and even more. We will consider some errors from real projects, and will discuss how we can prevent the same errors. For decades C++ developers have built software around OOP concepts that ultimately didn’t deliver - we didn’t see the promises of code reuse, maintenance or simplicity fulfilled, and performance suffers significantly. Data-oriented design can be a better paradigm in fields where C++ is most important - game development, high-performance computing, and real-time systems. “Regular” is not exactly a new concept (pun intended). If we reflect back on STL and its design principles, as best described by Alexander Stepanov in his 1998 “Fundamentals of Generic Programming” paper or his lecture on this topic, from 2002, we see that regular types naturally appear as necessary foundational concepts in programming. Writing high-quality error-free C++ code itself is a challenging task, let alone when having to juggle multiple platforms at the same time! In this session, we will talk about the many challenges in cross-platform C++ development and how tools can help: what options do I have if my production environment is different than my dev box? Can I be as productive when working with remote Linux machines? Is there any good C++ editor that works consistently on all platforms I work on? How can I efficiently build and debug CMake projects, and even get IntelliSense? How can I easily find and use open sourced libraries? Is there an easy way to write and run cross-platform tests? 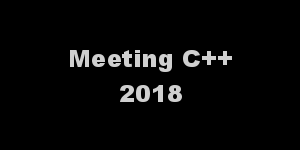 Come to this demo-heavy talk to see what Visual Studio 2017, Visual Studio Code, CMake, WSL, Vcpkg and more have to offer to make cross-platform C++ development much easier.